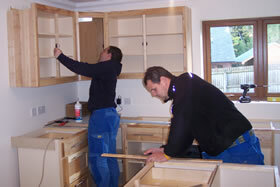 Your new Thwaite Holme kitchen will be fitted by our own team of experienced fitters with care and attention. Every step will be taken to ensure little disruption to your daily routine. 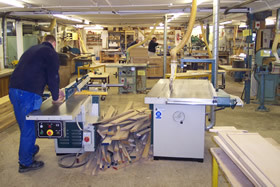 Each individual kitchen or bedroom is made in our workshop near Dalston. We have a very skilled team with years of experience in cabinetry and bespoke furniture who pride themselves in the quality of each piece of work they produce. At Thwaite Holme our aim is to offer custom built kitchens and bedrooms to suit the needs, tastes and lifestyles of every customer. Every design we produce is personal to that customer. Our showroom has a selection of popular styles from classic to contemporary in oak, walnut, maple, ash and also hand painted. It gives an insight into the traditional craftsmanship and attention to detail that is a feature of every piece of Thwaite Holme furniture. 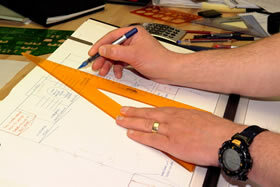 On viewing our showroom an appointment can be made for our designer to come to your home to discuss your requirements. To complement the fitted units we offer a wide range of sinks, appliances and worktops in granite, wood and laminate.